Hanmi handachi waza is a common form of Aikido practice whereby the nage is in a kneeling position and the uke attacks while standing. In this type of training the uke has the obvious advantage of both mobility and height. However, a skilled nage can still take the balance of the uke by taking advantage of their lower centre of gravity. Training in hanmi handachi waza is particularly beneficial as it develops skills in taking a uke‘s balance with only minimal lower body movement. 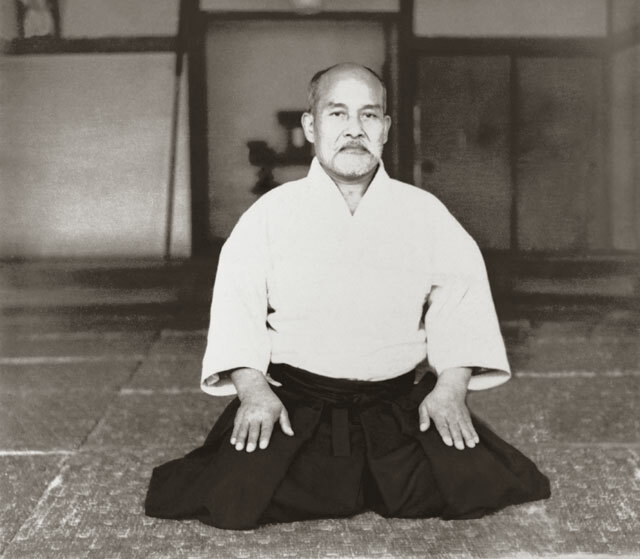 The training also assists in understanding the importance of centre and use of the centre line in Aikido practice. The below video extract of Master Koretoshi Maruyama demonstrates the application of kotegaeshi (outward wrist turn) in hanmi handachi waza to address a straight blow to the centre of the head (i.e. shomenuchi). The balance of the uke is completely taken (i.e kuzushi) from the moment of first contact. The technique is executed to take advantage of the “missing third leg” position to the rear of the uke. Beautifully demonstrated. A skill I aspire to achive someday if I work harder.